Want your wedding stationery design to be one of a kind—something that is seldom seen in weddings today? Then, you should definitely use wedding catalog designs. You may already be familiar with them since these are the same printed professional booklets that companies use to showcase all their products or services. However, for a catalog to work as a wedding stationery, it will need to undergo a radical transformation. In this article, we will provide you with comprehensive information on and ample examples of sample wedding catalog templates. This way, you will know how to seamlessly incorporate one into your own wedding ceremony. Sounds great, right? A wedding catalog is a printed document, usually, in booklet form, that will list all the components or details of a wedding that a wedding guest needs to know. It is similar to a wedding brochure. However, wedding catalogs are bigger in size and will contain more comprehensive pieces of information. In short, a wedding catalog is like a book all about the wedding. And, since wedding catalogs tend to be bigger in size than regular wedding program cards and brochure cards, they will also have more space for different kinds of content like photos, maps, announcements, etc. Remember, a wedding catalog is not your wedding invitation card. It is more than that, and we explore these essential differences and why you need to use wedding catalogs next, so read on. Hopefully, the reasons listed above have helped convince you into creating your own wedding catalogs. If not, then why not take a look at the different catalog template examples we have embedded below? Who knows? You may get inspired by these creative wedding templates and resolve to use them for your own wedding. The Multipurpose Wedding Catalog Template shown below is an example of a versatile catalog template as it can be used both as a wedding catalog template or as a fashion catalog template. 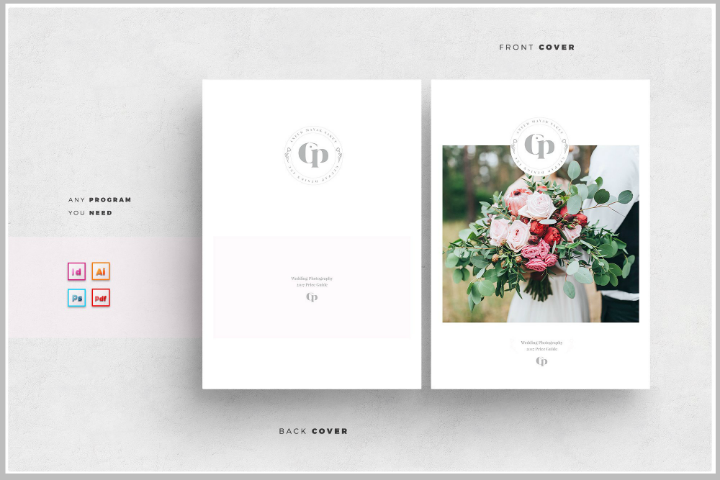 This wedding catalog template works like a portfolio template since it allows users to showcase more photos and illustrations on the template. With this template, you may customize its color background and use your official wedding color instead. The template’s download file is available in Adobe Photoshop, Adobe InDesign in use, MAC Pages, Microsoft Word, and Microsoft Publisher file formats. This template also includes 16 pre-formatted templates and prints out on quality paper that measures 23.62 inches by 8.5 inches. The PSD Multipurpose Wedding Catalog Template shown above is a catalog template that can also work well as a wedding event brochure template. Use this template if you want the freedom to customize all the images, texts, and graphic design elements on the template. 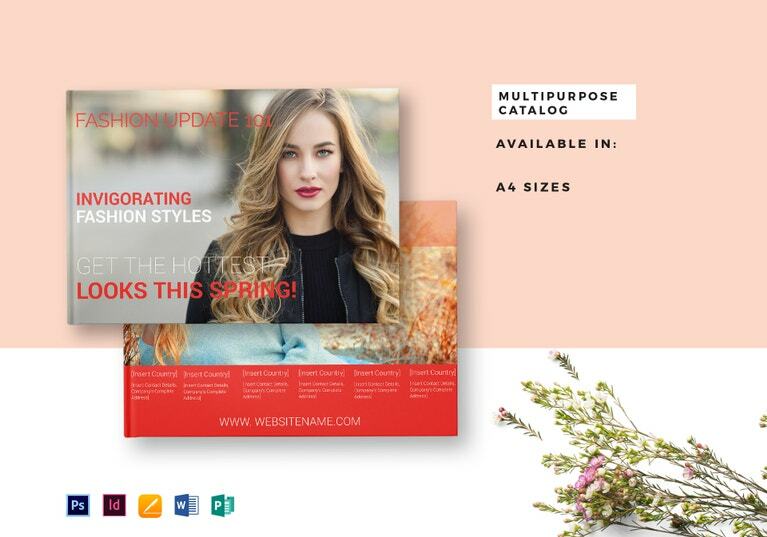 Aside from creating a physical copy of this catalog template, you may also send it electronically as part of wedding email templates or send a link to social media. The printed version will have 24 pages and measure 23.38 inches by 8.26 inches. A useful trick when creating catalogs is the heavy use of images. Couples and wedding planners may also easily apply this to their own wedding catalogs by generously adding wedding and engagement photos on the catalog template. 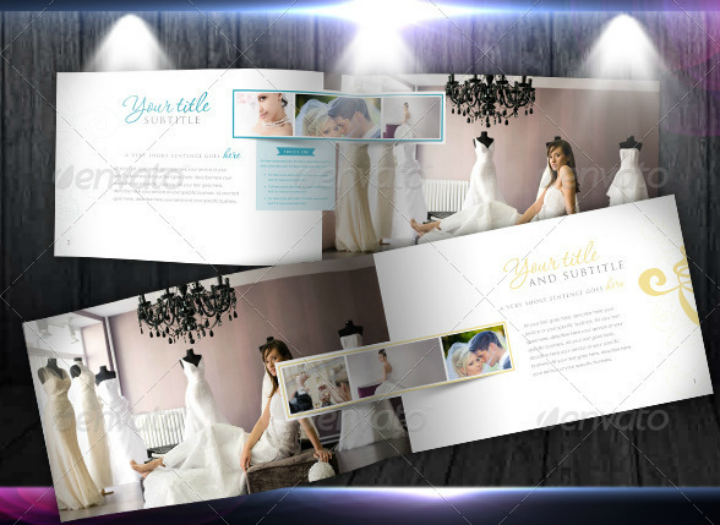 To do that, you may use the Editable Portfolio Wedding Catalog Template shown above. 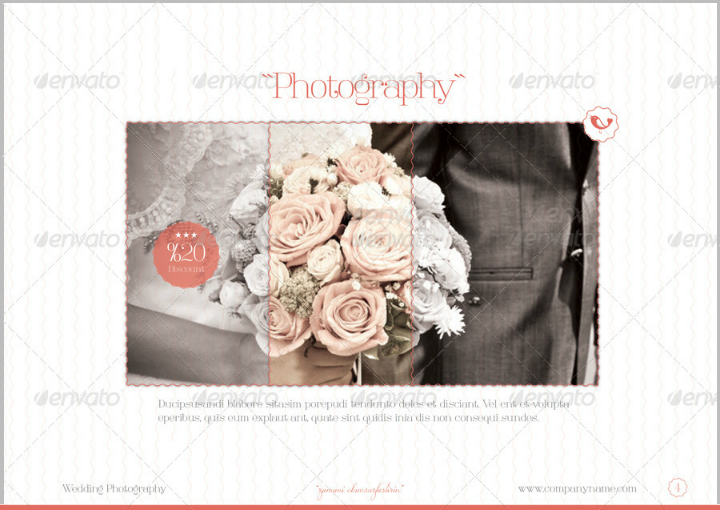 You may also see PSD wedding templates. This catalog template may easily be customized for a wedding stationery since it already includes all the desired elements of a good wedding stationery design. To make this catalog template more captivating, make sure to add your own high-quality photos and input text or paragraphs following the pre-formatted wedding layout template. This printable template is available in two printed sizes: 22.23 inches by 8.73 inches and 23.62 inches by 8.5 inches. Why should you use wedding catalogs? Still debating whether to use wedding catalogs for your own wedding? Let us convince you more by listing the advantages when you use wedding catalogs. You may also see PSD catalog templates. They allow you to gather all wedding details in one printed form. In traditional wedding stationery preparation, there can be separate templates for creating wedding program timelines, wedding detail cards, wedding advice cards, and even wedding reception timeline guides. Creating and using a separate template for each of these printable wedding cards can be exhausting, especially if you have a lot of guests. That is why wedding catalogs can be a practical bridge between these tasks. This way, you do not have to separately create these rustic wedding stationery items. 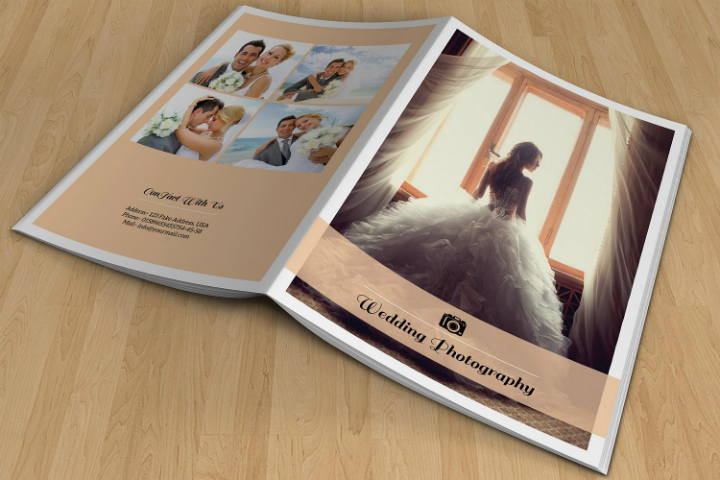 Wedding catalogs allow you to gather a lot of wedding details into one place and create a booklet out of it. This approach is also advantageous to guests since they do not have to refer to different pieces of paper for each aspect of the wedding. You can add as many pictures, images, and illustrations on the catalog as you want. Another advantage that comes with the use of a wedding catalog is its capacity to host multiple images, texts, and illustrations. Depending on your sample budget and personal preferences, you may opt to add pages to the catalog template if you think that its current page layout is not enough. With a wedding catalog, you may add photo collages, photo essays, lengthy essays, or stories about the couple since a catalog layout template allows for this format. They can substitute for different wedding papers. As mentioned earlier, there are different kinds of wedding cards that may be used for a wedding. However, by using a wedding catalog, you can eliminate the need for creating separate wedding papers since the wedding catalog will include all these wedding stationery items in its template design. To illustrate, you can easily add a section for the wedding program, wedding menu card, and wedding seating chart on the wedding catalog for guests to refer to when they get to the wedding. More than that, you may also easily customize a wedding design template to match your own wedding theme or motif. It is that easy! They can make your wedding appear more organized and more formal. Using a wedding catalog template also helps make your entire wedding theme design appear organized and formal. This may entirely be for aesthetic reasons but, for those couples who want a clean yet elegant wedding stationery theme to match an elegant wedding motif, going the wedding catalog route may be the answer for them. Wedding catalogs may also appeal to couples who want to reduce their paper usage (and, in effect, their carbon footprint) and stick to things that matter the most for their wedding without having to forsake the more fun aspects of it. If this is you, then check out the different wedding catalog templates that we have included in this article. They serve as handy wedding souvenirs. Another practical reason for using wedding catalogs is that they can double as wedding souvenirs. They resemble a thin book filled with pictures and memories of the event. Couples may also include cut-out coupons as one of the catalog pages and use this as a wedding favor tag. Guests may appreciate this kind of favor more if they can exchange the coupon for things like food or minor grocery items. This approach also frees couples from creating separate wedding gift tags. Looking for a wedding catalog template that will match your equally elegant wedding invitation template? You may like the Elegant Wedding Catalog Template featured below. As an InDesign template, you can easily edit all the 16 pages of this catalog template. All pre-formatted pages will print out on A4-sized paper or card stock. Remember, this template will not include images. You will need to use your own photographs and attach them to the different image placeholders. It also follows a clean and minimalist layout format, so it will match formal wedding ceremony and reception events. Choose the White Wedding Photography Catalog Template shown below if you want a wedding catalog that follows a sample landscape orientation. This type of booklet orientation makes it easier to insert images and illustrations. 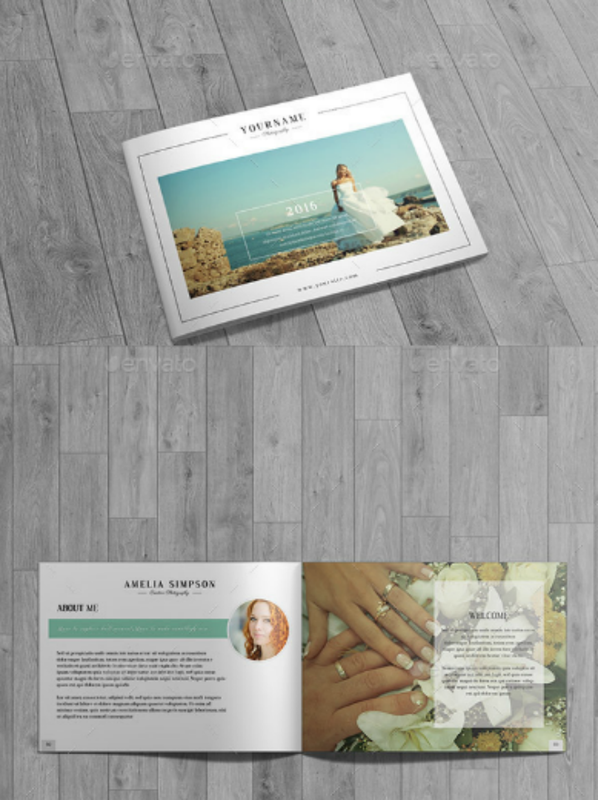 This wedding catalog template allows for 24 pages of wedding details and pictures. All pages also come with a pre-formatted 3-mm printing bleed. Each page measures 210 mm by 148 mm when printed out. Also, note that this wedding booklet template prints out on front and back sides, so you may need to adjust your printer’s settings if you are printing the catalogs at home. 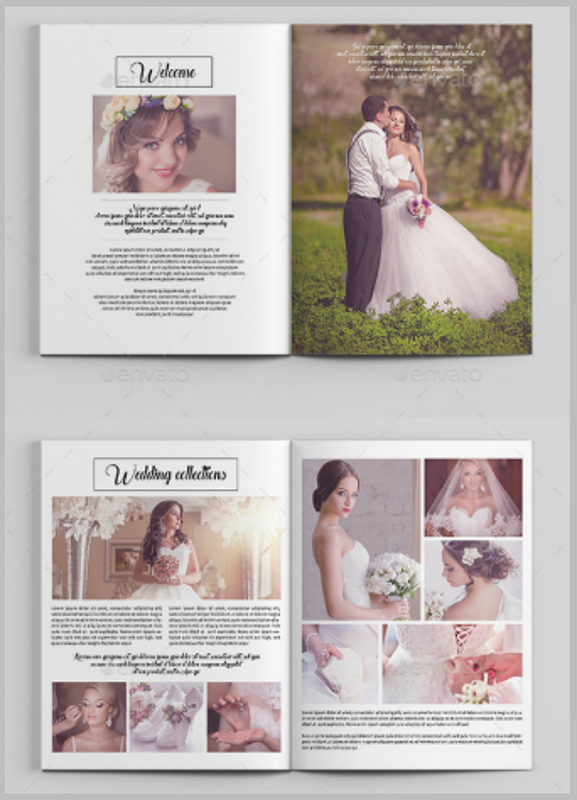 The White Wedding Photography Catalog Template is available as a Photoshop file download. This means that you will need to have Adobe Photoshop installed on your computer before you can open and edit the template. 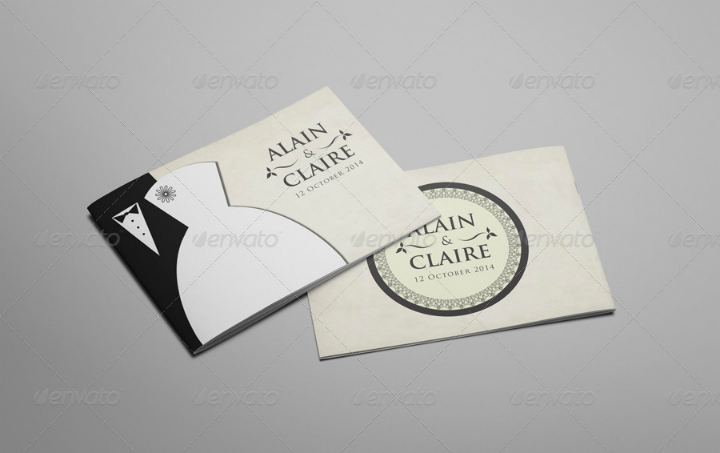 You may also see wedding logo designs. Choose the Portrait Wedding Photography Catalog Template embedded below if you want to beautifully showcase all your pre-wedding photos. You may also see wedding chart templates. When customizing this template, it may be best to add little touches that can customize the look of the catalog template. These little touches may include small wedding icons and your own wedding logo design. All graphic elements used in this template have a 300 DPI screen resolution and follow the CMYK color model. This ensures that what you see in the template is exactly what you get when the template prints out. What is great about this template is that couples can choose to have full page photo spreads to showcase all their beautiful pre-wedding photographs. Other page layouts also call for photo collages—a good option for miscellaneous images that you may have compiled. 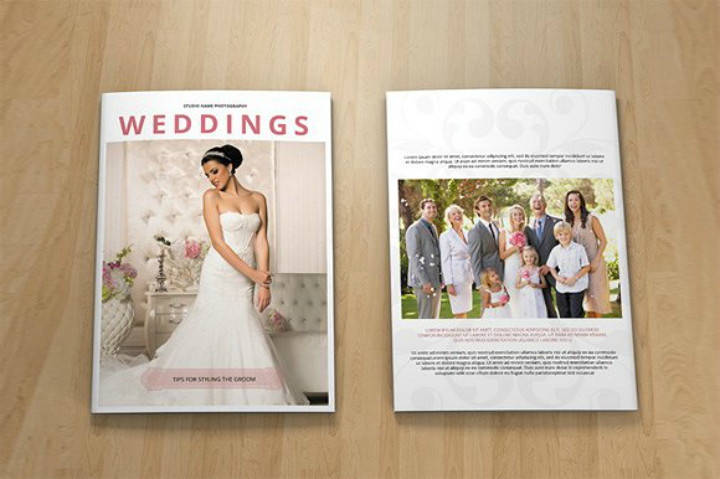 Wedding catalog templates are not limited for use by couples and wedding planners. They may also be used by photographers who specialize in wedding photography. 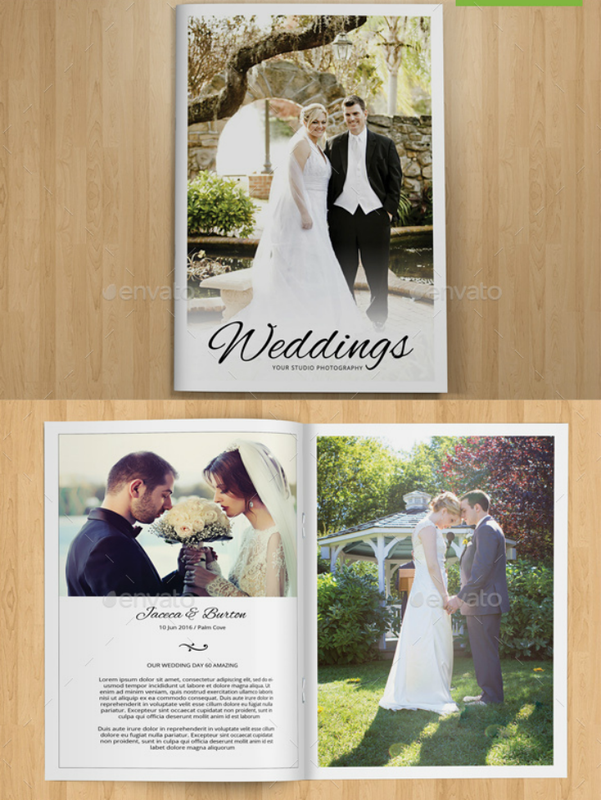 An example of a catalog template for this purpose is the Editable Wedding Photography Catalog Template shown above. This printable wedding template can be customized to showcase different wedding photo packages and price lists that a photographer offers. The template shown above includes multiple pages of editable text and graphic elements. Even if the catalog mock-up depicts a business catalog template, it may still be used to create a simple wedding catalog as long as you know how to edit all the template titles and headings in Adobe Photoshop. Are you looking for a simple yet elegant wedding invitation catalog design? Take a look at the wedding catalog template below and you may just have found the one for you. 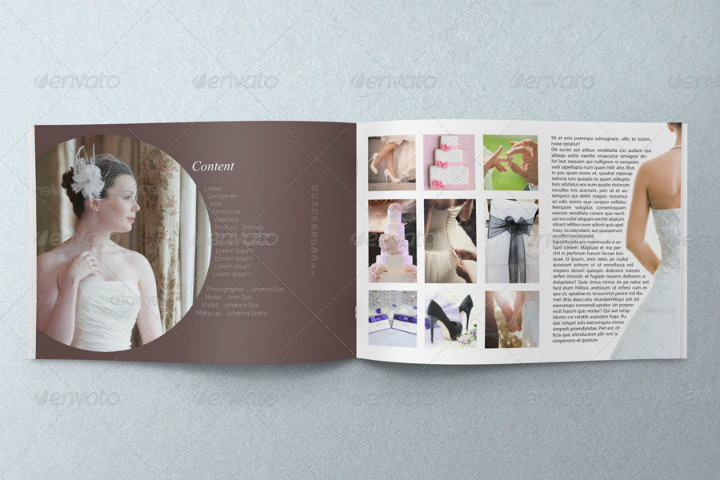 As its name suggests, the Wedding Magazine Catalog Template embedded above follows the layout of a commercial magazine. Text and image placeholders are strategically placed all throughout the template so that it resembles a real magazine but without the ads. This wedding magazine template may also best suit couples who want a minimalist and clean-looking wedding stationery design. 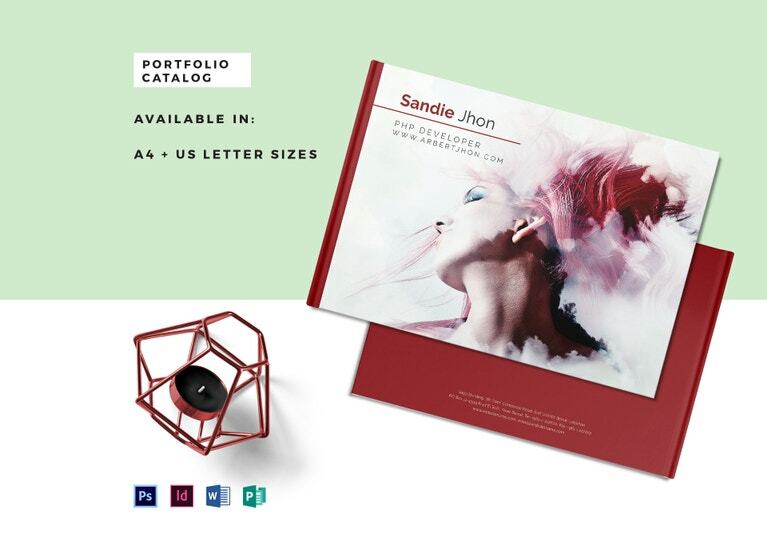 This catalog template may be opened and edited in Adobe Photoshop, Adobe InDesign, and Adobe Illustrator. Also, always remember to use high-quality versions of your photos when it is time to add them to the catalog template. Are you looking for a good marketing tool for your wedding photography business? If yes, look no further than the Vogue Wedding Catalog Template embedded below. This wedding catalog template works both as a wedding stationery design and as a printed marketing media for businesses in the wedding niche. The template was created and stored using Adobe InDesign. This means that with even basic knowledge about InDesign, you can easily make customizations to this template to suit your needs. When you use an actual wedding catalog to showcase the different photographs that you have taken, brides will be more intrigued and attracted to the idea of using wedding catalogs. And, if it is not yet part of your business model, you may as well incorporate wedding catalog creation as one of your profit-generating services. For more tips regarding this aspect of running a business, check out our essential guide to making a business plan. 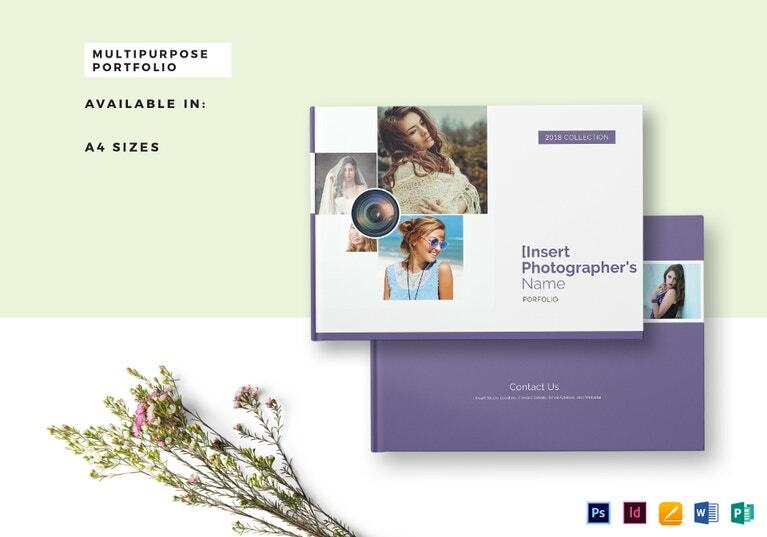 For those who are looking for a more structured and formal way to present their wedding photography portfolio, you may like the Professional Wedding Photography Catalog Template (shown below). This wedding catalog template will suit professional photographers who have established a client base. With this kind of catalog template, you may also feature any clients that you have photographed. This way, potential clients will be able to see samples of your work. For couples who opt to have a DIY invitation, you may further customize this wedding catalog template and use it as a wedding stationery instead. Just remember to edit all the headers and text placeholders. 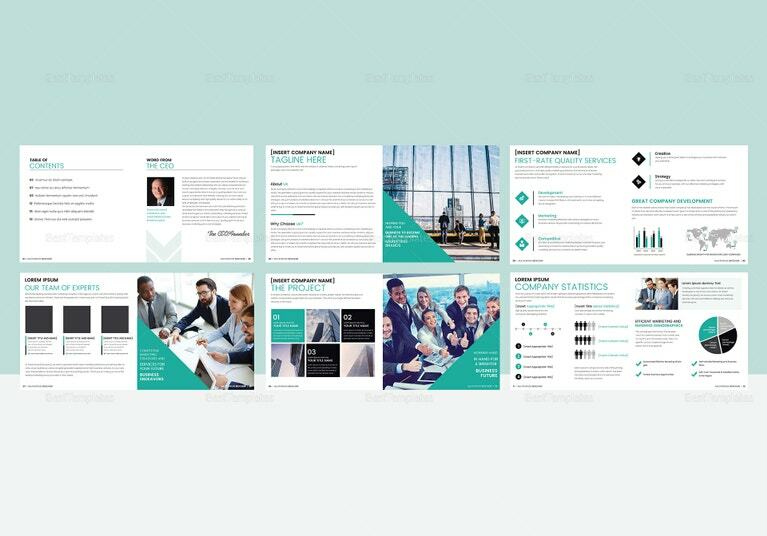 This template includes 24 pre-formatted pages, and each page prints out on landscaped A5-sized paper. For a more luxurious appeal, choose a thick, high-quality paper to print this out. All pages also sport a 3-mm printing bleed. You may also see wedding card templates. What wedding catalog template should you choose? The most important factor to consider when choosing among different wedding catalog templates is your own wedding theme or motif. If you are still in the beginning stages of wedding planning, you may jump around different wedding themes depending on the wedding catalog design that you like. However, if you have already chosen a wedding theme, it may be more difficult to find a catalog template that will exactly match your official motif. If this occurs, choose the template that can allow for easy customization. This way, you will still be able to recreate the different design elements that you want. You may also see wedding banner templates. To illustrate, if you have chosen a vintage wedding template theme for your wedding invitations, choosing a vintage-looking wedding catalog will do the trick. Remember, your wedding design or theme needs to be uniform or at least complement each other in order to create a sense of harmony in your wedding stationery and decor. Also, do not forget to have fun during this stage of the wedding planning process. Do not fret too much if a design element is not perfect. This way, you will not get too stressed out before your wedding date comes around. Happy creating and enjoy your wedding! You may also see wedding album designs.